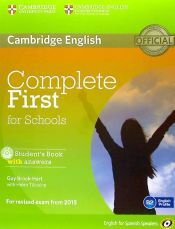 Otros libros de Brook-Hart, Guy son Complete First For Schools For Spanish Speakers Student's Book Without Answers With Cd-rom, Complete First For Schools For Spanish Speakers : Class Audio Cds, Complete First Certificate For Schools For Spanish Speakers : Class Audio Cds, Complete First For Schools For Spanish Speakers : With Teacher's Resources Audio Cds, Complete First Certificate For Spanish Speakers: Student´s Book With Answers And Cd-rom, Complete First For Spanish Speakers Student's Book Without Answers With Cd-rom 2nd Edition, Complete First For Spanish Speakers Student's Pack Without Answers (student's Book With Cd-rom, Workbook With Audio Cd) 2nd Edition y Complete First For Spanish Speakers Student's Pack With Answers (student's Book With Cd-rom, Workbook With Audio Cd) 2nd Edition. .
El autor de Complete first for schools with student's book, keys and cd-rom, con isbn 978-84-9036-390-4, es Guy Brook-hart, esta publicación tiene doscientas setenta y dos páginas.